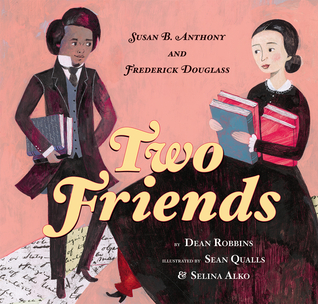 I attended a Scholastic 2016 picture book preview earlier this month where I had the honor of hearing Selina Alko and Sean Qualls describe their collaboration on the illustrations for Two Friends. Below is a photograph of original artwork from the book. 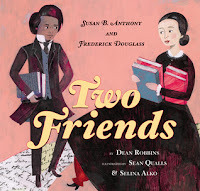 Two Friends is an beautiful, informational picture book about Frederick Douglass and Susan B. Anthony. The story begins with Douglass and Anthony enjoying tea together in Anthony's parlor. The narrative then flashes back and describes Anthony's early life and how she "taught herself to give speeches" in support of women's rights. The story shifts to Douglass' early life as a slave when he "secretly learned to read and write." Douglass also gave speeches and used his gift for words to speak in support of African American rights. The story concludes in Anthony's parlor with the friends having tea as they share their plans, their speeches and their ideas for changing the world. Alko and Qualls explain in an illustrators' note that they researched the time period, especially the clothing, when they created the acrylic paint, collage and colored pencil illustrations. Words permeate the illustrations, escaping in the steam from the tea, printed on Anthony's bloomers, and flowing through the air as Douglass speaks. The colors, textures and patterns will make readers want to linger on each page. One of the many strengths of the book is that it works for very young readers as an introduction to two important figures from American history, and it's effective for older students learning about civil rights and the power of words. Be sure to read the author's note from Dean Robbins in the back of the book. A bibliography provides readers with more books on the topic. Two Friends would make an excellent read aloud for small or large groups and is a recommended purchase for school and public library collections. Loved it! 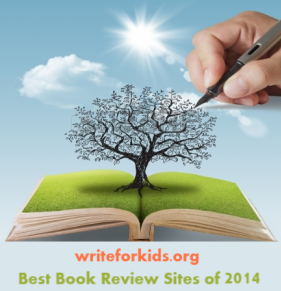 A perfect intro for young readers with amazing illustrations! Love this review! If you're interested, we'd love for you to link up this post with the Diverse Children's Books Link-up. 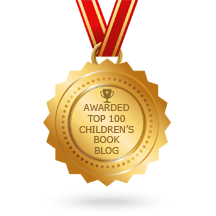 You can find it at http://pagesandmargins.wordpress.com/2016/04/16/diverse-childrens-books-link-up/. Thanks!